I would buy this one for the building alone. 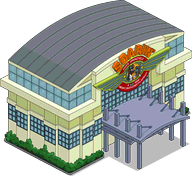 I like the Soarin’ building for Springfield and the fact that it has permanent tasks (and not for everyone in Springfield). Squeaky Voice Attendant is a decent throw-in, considering he’ll help with the event. At 100 donuts for the two, I do think it’s worth it. Of course, in the end, it’s your decision, we can only tell you what we would or wouldn’t do…and as a premium player, I’ll be picking this up (and placing in my Efcot area). But whatever you decide, just make sure you make your final decision before it leaves our games for good (or for now). SV Attendant will also have a 30m task to sneak an ice cream if you have the truck..
Bart: Dad, can we go on Soarin’ Over Springfield? Can we, can we? It’s got a huge screen, and they suspend you off the ground, and it feels like you’re flying. Homer: So… it’s a crappy ride and an IMAX movie that’s not even in 3D? Bart: Uh, right. Oh, and also Milhouse is going, and he throws up on every ride no matter how lame. Homer: THIS I GOTTA SEE! LEAD THE WAY! Lisa: Mom, can we go on Soarin’ Over Springfield? Can we, can we? It’s got a huge screen, and they suspend you off the ground, and it feels like you’re flying. Marge: So… it’s a crappy ride and an IMAX movie that’s not even in 3D? Lisa: Uh, right. Oh, and also there’s a really long line. Marge: A CHANCE TO MEET AND TALK TO INTERESTING STRANGERS?! LEAD THE WAY! What are your thoughts on Squeaky Voice Attendant and Soarin’ Over Springfield? Will you be spending the donuts to bring them to your Springfield? Did you already? Why or why not? Where have you placed it in your town? Sound off in the comments below, you know we love hearing from you! This entry was posted in Buildings, Characters, Donuts, Should I Buy, Tips and Tricks, Updates and tagged how do I earn more Itchy and Scratchy event currency, is Squeaky Voice Attendant a skin, Should I Buy Soarin' Over Springfield, Should I Buy Squeaky Voice Attendant, Soarin' Over Springfield questline, Squeaky Voice Attendant tasks, Tapped Out Itchy and Scratchy, Tapped Out Tips and Tricks, Task and Soarin' Over Springfield, The Simpsons Tapped Out, TSTO Addicts, TSTO Itchy and Scratchy Land Event, TSTO Tips and Tricks, What does Soarin' Over Springfield Do, What does Squeaky Voice Attendant do. Bookmark the permalink. I’ve got $238M in cash and can’t buy a single plot of land. What’s the point anymore? I can’t tell if it pays out 60 axes and 25 I&S money for both characters in total or if that is the payout for each character. Yeah, it’s 60 and 25 for both, which is a bad deal. Bummer. At first I was going to pass on this combo but after purchasing it I must say this is one of the few where I DON’T have buyer’s remorse. At first I thought it was just a building but it fact it is a “ride” akin to IMAX 3D rides and that’s perfect for my plans for my KISLand to have a complete look. I’ve always loved the versatility of the SVT and now he’s an KISLand employee with the uniform to prove it 🙂 And the dialogue between SVT, Bart, and Lisa make it all worth it IMHO. Now I’m bummed. I thought this was a take-off of one of the old attractions at Great America in Gurnee, IL. In 1979, Great America (then owned by Marriott) added The Pictorium. Basically, it was a theater with a HUGE screen and all seats are pretty close to the screen. The original show was called “To Fly”. Lots of film from within stunt planes. You felt like you were in the plane with the vertigo and stomach drops and everything! Looked up Disney’s California Adventure, and the Sorin’ Around the World. Yup, direct parody. Bummer. And, now, I’m doubly bummed, because the Pictorium was torn down this spring. Guess 15-minute IMax movies didn’t draw in enough customers. Well…the Disney version takes it one step further…by having people “suspended” in seats that move to the action…and they have wind and heat and other additional “mind warps” to add to the fun. This is a meh & pass for me. Good deal for freemium players if you haven’t picked him up yet. Like Duffman, building, character and skin. All for 100! Let me begin by saying I have a very strong love/hate attitude about all Disney Parks and I still refer to Disney California Adventure as Six Flags over Walt’s Dead Frozen Body. However Soarin’ is one of the few attractions that merits high praise and is a must have for my Itchy and Scratchy Park. I like the building…it adds an attraction that isn’t a “shake you till you throw up” ride.😄 It also gives me a place for the I&S holgram that’s been in storage since Future Springfield got the axe (ah…the too many pieces blues). I really hope the hologram gets offered again. I instead bought some of the music mystery boxes for items that I missed. It took me to around 300 donuts, so unless the building animation is really cool, I plan on skipping this. The windows just light up. I got it because of the building design. Not disappointed. Check your inventory. Some characters were stored automatically when KL was nuked. Have you checked your Inventory? He was more than likely stored after KL was nuked. Found him! Thanks for the help! Personally I wouldn’t recommend it. I got it because I thought I’d like the building more than I do. The skin is completely useless for me (other than event currency) because I have the Peasant skin and I love it. I think it’s a nice looking building. Too nice. I want my I&S land to require a tetanus shot. Idk where I’d put it outside of I&S land other than my already overcrowded SH. I don’t want to drop a hundred donuts on a building I’m iffy on. While the event currency would be nice (I got Diane with only hours to spare), this is probably a wait for mystery box for me. Yep I love the peasant skin it’s awesome .. so will be passing on this one.. Being a huge Disney person, this was a must-buy! In fact, I also moved my Efcot Center into Itch & Scratchy Land as it now has a place where it fits in. I also moved the Castle of Equalia into I&S Land because, well… I think you get the idea! Now we just need Tinkerbell! We already have her – Fairy Kodos! Fairy Kodos is the one purchase I regret buying the most because of the flying task that gets in the way on the screen & wont compleate. I didn’t even think about Castle Equalia! Thank you! I’ve devoted my entire Springfield Heights area to Efcot and ISL. Plus Holiday Land and Spooky Town. Unfortunately, I lost Italy and England artifacts from the rollback glitch fix, but perhaps I’ll be able to reacquire them in the future (really miss the London Eye and Leaning Tower). I still had the Eiffel Tower, Mt Fuji, and various others that work for my Circle of Nationz. Thank you! I finally have a spot for Efcot!